Step 1 In a medium saucepan, completely dissolve the sugar in 2 cups of water over low heat. Add the honey, remove from heat and allow the mixture to cool completely. Step 2 In a large heavy-bottomed saucepan, cook the apples with the remaining 2 tablespoons water over medium-low heat until they are very soft and break up when mashed with a fork, about 20 minutes. Remove the pan from the heat and cool completely. Step 3In a blender, puree the cooked apples and the honey syrup and process until very smooth. Stir in the cinnamon. Chill completely. Step 4Process the sorbet in an ice cream machine according to the manufacturer's instructions. Yields 1 1/2 pints. In Recipes-list.com we have selected the most viewed recipes from category - Desserts . Enjoy the best recipes specially selected for you! 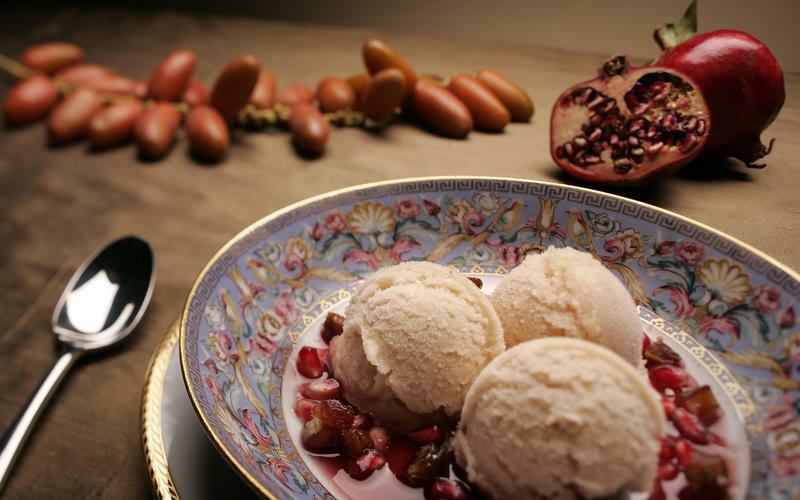 Apple and honey sorbet with pomegranate sauce is the right choice that will satisfy all your claims.